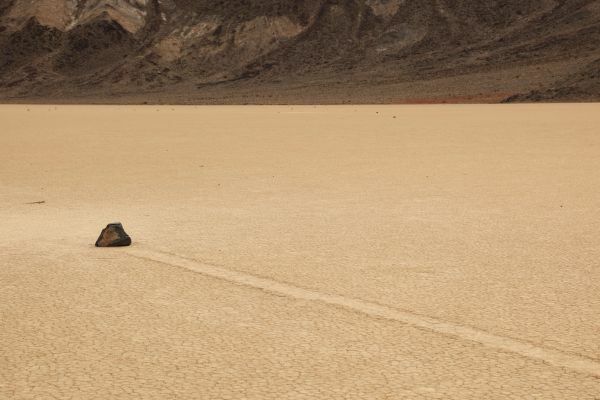 Sailing Stones is a video about a moving image that you cannot see move, moving stones that you cannot see move. Filmed on location at Racetrack Playa, California, within the boundaries of Death Valley National Park, Racetrack Playa is perfectly flat dry lake surrounded by domineering dolomite cliffs. On the floor of the ancient cracked white clay bed rest several pebble to boulder-sized rocks which appear to have broken off the cliffs on the south end. Each rock seems to have traveled along the bed, leaving behind a mysterious path. 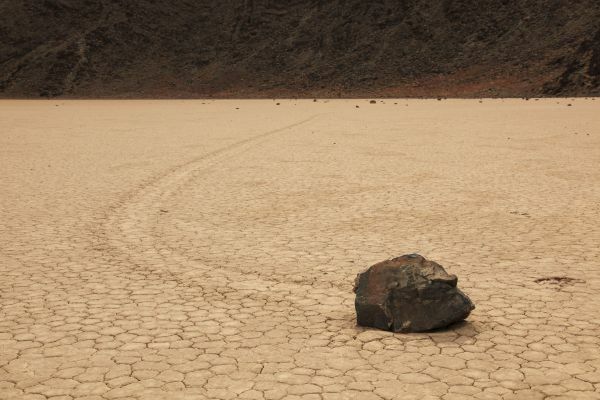 According to NASA description, « some rocks travel in pairs, their two tracks so perfectly in synch along straight stretches and around curves that they seem to be made by a car. Others go freewheeling, wandering back and forth alone and sometimes traveling the length of several football fields. In many cases, the trails lead right to resting rocks, but in others, the joyriders have vanished ». Adrien Missika's portrayal of this geological site focuses on a particular temporality, a longue durée, a slowness that is given by the changing land, one that we can never witness in our lifetime. Captured with several lengthy fixed shots, initially one has the impression of being faced with photographs transferred to video, given their dominant sense of stasis. In this work, Missika takes painting as the horizon for the images construction (by way of the eminently Friedrichian subject of the great expanse, the fixed picture plane, still composition and reduced internal action) but uses film to add to its perception, which is one where the viewer regains a particular awareness of time and (indirect) motion. If photography condenses time, capturing the ephemeral, the fugitive, the contingent, the instantaneous, film can be defined as a succession of moments or instants that replace one another. In film, each shot can potentially replace the other or each shot can accrue, as with Sailing Stones and its distention of time experienced. Here, each cut from one shot to the next is abrupt, but rather than disappear in montage, the video remains sutured, bringing the now of the disruption, which is the time-space of the viewer, into the realm of the work.